This weekend we celebrate the first Sunday of Advent. And as they’ve done for 31 years, our student music ensembles will present sacred music for the season from The Great Hall. The performances are entitled Christmas at Saint John’s. In my opinion, there’s no better way to start the Advent and Christmas seasons. A solo flügelhorn intones the hymntune “Let All Mortal Flesh Keep Silence,” then the members of the CSB/SJU Chamber Choir begin an ethereal “O Magnum Mysterium” by Morten Lauridsen. The next section of the concert features a set of music from each of the three aforementioned college choirs, the Amadeus Chamber Symphony and the Saint John’s Boys’ Choir. Some pieces are Renaissance polyphony, others German folk carols, and still others African American spirituals. In between each set of songs, the audience stands and sings carols including “O Come All Ye Faithful,” “The First Noel,” “Hark! The Herald Angels Sing,” “What Child Is This,” and my personal favorite, “Silent Night,” or “Stille Nacht,” in German. During that carol, I like to imagine the Bavarian monks and Collegeville parishioners, singing it in the same space we now call The Great Hall, during their Christmas Eve Mass. To close the concert, the choirs all join again in a Baroque choral work with the orchestra, and the audience stands again at the first notes of Händel’s “Hallelujah” chorus from “Messiah.” As the final notes ring during “Joy to the World,” we light the Christmas tree. It’s all a bit schmaltzy by that point in the evening. But that’s OK by me – the concert’s progression from melancholy to poignant, joyful, and then victorious is intended by the musicians and their conductors. Professors Justin Zanchuk and Susan Cogdill, former professors Dale White and Phil Welter, conductors Andre Heywood, Br. Paul Richards, and Fr. Anthony Ruff, organist Kim Kasling and Axel Theimer have conducted Christmas at Saint John’s over the decades, and they have positively impacted thousands of students’ lives. These Johnnies and Bennies, now alumni, have gone onto careers in all fields, including and beyond the arts. One thing they all share is that they remain moved by the tradition of these special concerts. Every year, hundreds of students prepare for months for these special performances. I was one of these student musicians years ago, and it’s important to note that without the Music Scholarship I received through the Student Fund, I wouldn’t have been able to be in the Chamber Choir, take voice lessons, and be part of this special experience. The same is true for today’s students at Saint John’s. More than half of all SJU student participate in music ensembles as part of their academic coursework, including the four college ensembles who perform at Christmas at Saint John’s, and more than a dozen other ensembles. Donors make this experience possible through scholarship support. 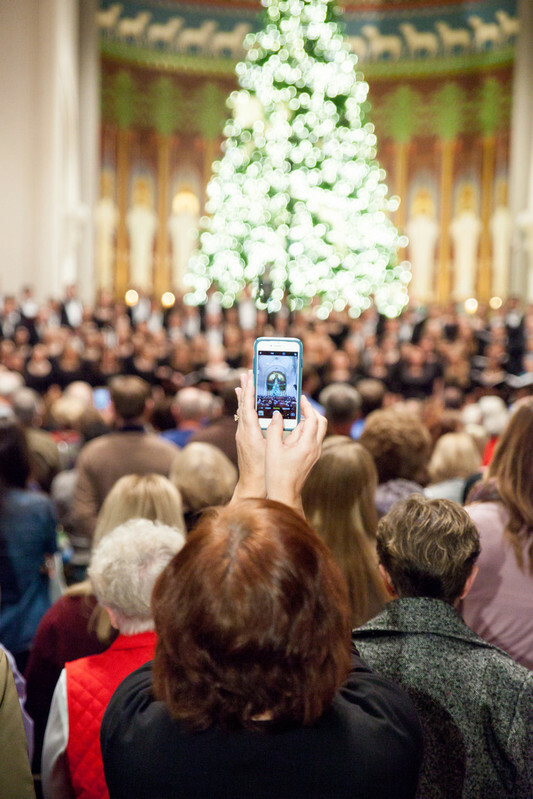 While tickets for this year’s concerts are sold out, as are tickets to Saturday night’s performance at the Basilica of Saint Mary in Minneapolis, we will broadcast online a livestream of the two Christmas at Saint John’s performances. Last year more than 1,100 alumni, parents and prospective students watched the livestream of our concerts. It’s our way of showing appreciation to the thousands of donors who support student scholarships through the Student Fund. And it’s also a special treat for parents and grandparents who live out of state to see and hear their SJU student perform beautiful and sacred music for the birth of Jesus.